Looking for something just a little bit different for your next trip? Does gazing up at endless starry skies and watching the dance of the northern lights sound enticing? 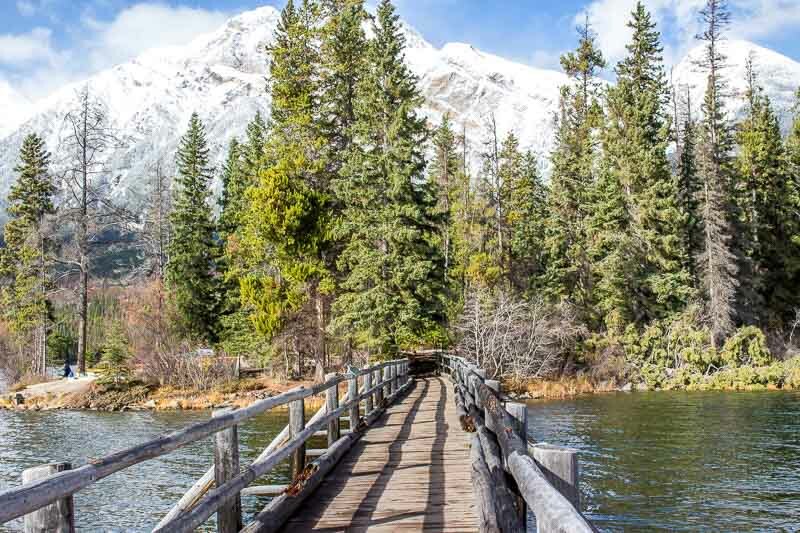 How about viewing stunning mountain scenery and seeing wildlife, like elk and moose, every day? Now what would you say if I said you can do all that while eating at fantastic local restaurants and staying in world class accommodations? The Jasper Dark Sky Festival delivers all of that and much, much more. The Jasper Dark Sky Festival – What is it? Every year, the Jasper Dark Sky Festival takes place in Jasper, Alberta, Canada. Jasper is nestled in the rugged heart of Alberta’s Rocky Mountains. It’s a small town that’s managed to keep it’s unique character, despite being a major tourist attraction. Bighorn sheep and elk are regularly spotted in town, and the town site and surrounding area are home to some of the most stunning views of alpine lakes and mountains you’ll ever see. The Dark Sky Festival takes place over two weekends in October that are packed with events, speakers and activities that feature science, space and conservation. There’s even a little bit of geeky celebrity magic that happens here: past speakers have included George Takei (best known as Sulu from the original Star Trek TV series), Canadian astronaut Chris Hadfield (check out his informative and entertaining Facebook account here), plus Kari Byron, Grant Imahara, and Tory Belleci (former co-hosts of Discovery Channel’s hit show Mythbusters). So when Tourism Jasper reached out to invite me to experience the Jasper Dark Sky Festival firsthand, I jumped at the chance. 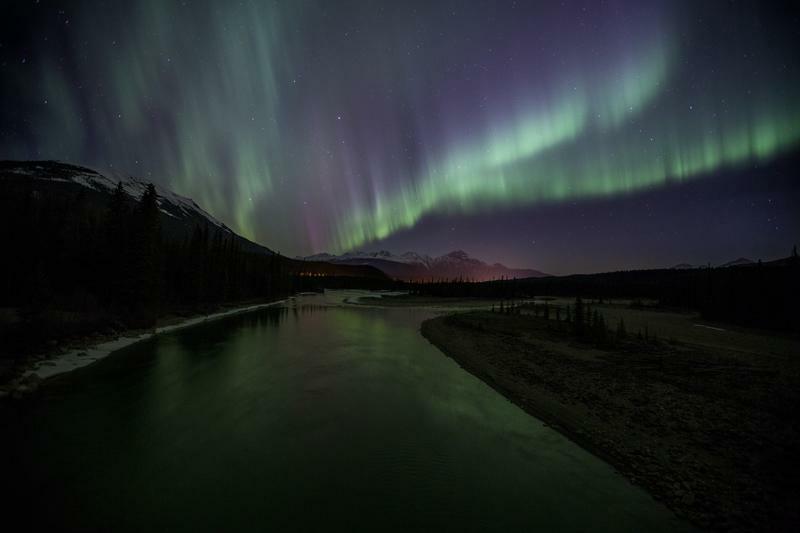 The Dark Sky festival is held in Jasper National Park, home to one of the world’s largest Dark Sky Preserves. In Jasper, the city and park have taken extra steps, like replacing older street lights with lights that point to the ground, rather than up, and cast less light. The result is stunning, clear views of the night sky – perfect for catching a glimpse of the Aurora Borealis or Milky Way. 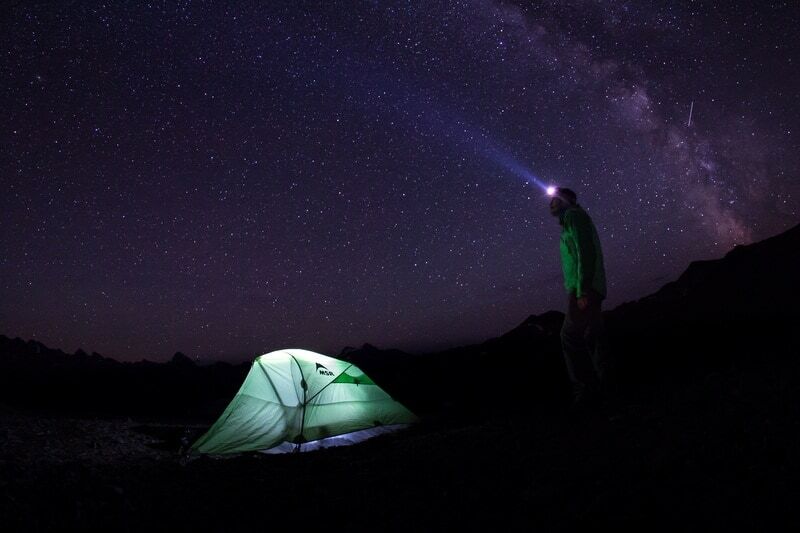 There’s so much to enjoy at the Jasper Dark Sky Festival, from world class talks, to taking in the night sky, to enjoying delicious meals that it’s hard to narrow it down to 10 reasons! That said, here are my top 10 reasons you should check out the Jasper Dark Sky Festival for yourself. There are plenty of opportunities to take in the stars at the festival, but don’t miss the Beyond the Stars event at Lake Annette. There’s plenty to do at this night time event, with expert guidance from the Telus World of Science – Edmonton, the Royal Astronomical Society of Canada – Edmonton Centre, Dark Sky photographers, Parks Canada interpreters and other special guests. For those of us who aren’t fond of cold weather, or those who just love their java, there’s a Tim Horton’s truck parked conveniently nearby, offering up free hot chocolate and lattes! There’s also a free shuttle from the Visitor Information Centre. It’s an other worldly experience to stand in the middle of the starlit sky, gazing up as the northern lights glow, and change shape, over Lake Annette. There’s a lot to see here, but one of my favorite activities was to stop by the telescopes set up and manned by knowledgeable volunteers. Each telescope was trained on a celestial object, from far away galaxies to planets. It’s an amazing experience to see these with your own eyes! Tip! A good stargazing app can make your experience so much more enjoyable! Try out Sky Map for Android (free) or StarWalk 2 for iPhone or iPad. Ever seen a photo of an impossibly perfect, clear emerald green lake in the Canadian Rockies? It was probably taken in Jasper. You can catch Jasper’s scenery pretty much, well, everywhere around town. Tourism Jasper has an excellent list of highlights here. For a gorgeous, birds-eye view, be sure to take the Jasper SkyTram‘s fully enclosed tram for some stunning views. Dogs are welcome! If you’ve ever been on Instagram, you’re sure to have seen an image of the beautiful Maligne Lake and Spirit Island. In warmer weather, the lake is a stunning green. You don’t need to be a nerd to love the Jasper Dark Sky Festival, but it doesn’t hurt. There’s plenty here for science nerds like me, from chances to chat with world class astronomers to hands on chances to view the stars. 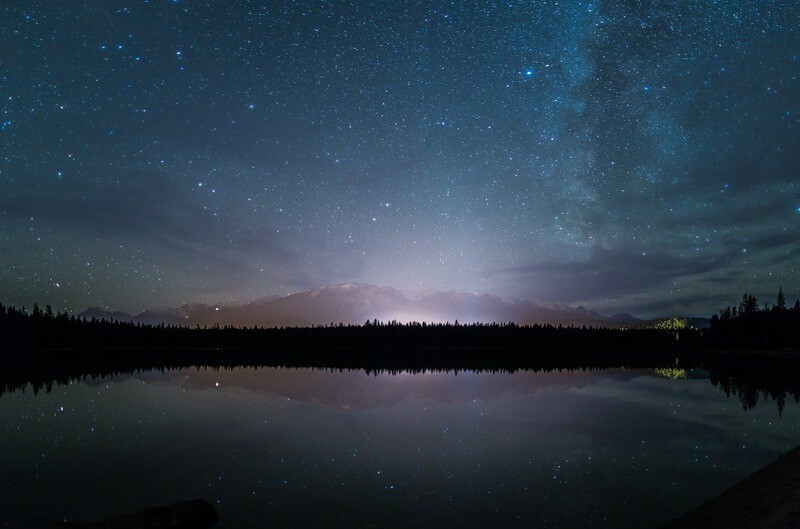 Be sure to check out events like Stargazing and Observe the Sun with RASC Royal Astonomical Society of Canada, which get stellar Jasper Dark Sky Festival reviews. Events vary each year, but there’s always plenty to do and see. 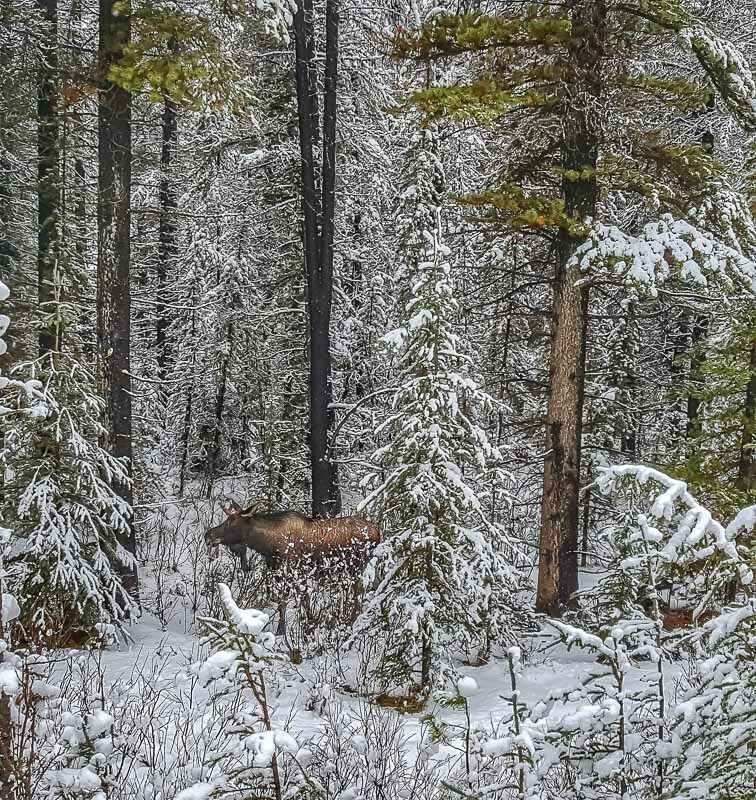 Jasper’s relatively untouched location in the Canadian Rockies means that it’s a great place to see wildlife. The park is home to elk, moose, caribou, mountain goats, bighorn sheep, bears and wolves, plus smaller animals like the adorable pika and marmots, plus many bird species. Tip! Keep your distance, as these are wild animals, and their behavior is unpredictable, no matter how accustomed they are to humans. It’s illegal and dangerous to touch or feed wildlife – both for you and the animals! Keynote speakers for the Jasper Dark Sky vary by year, but they’re sure to be informative and entertaining. They’re sure to delve into interesting questions like these. What is dark matter anyway? Why does space exploration matter? Will we ever colonize Mars? 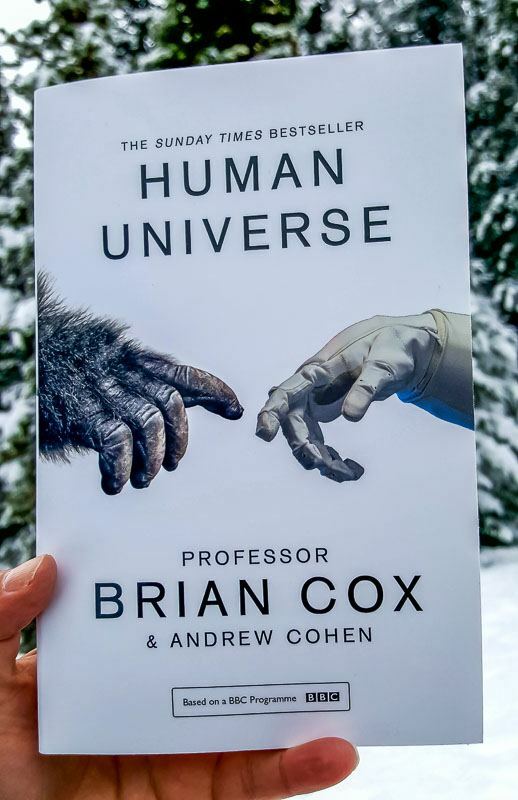 During my visit, the keynote speakers were UK Professor Brian Cox and Phil Plait, of Bad Astronomer fame. The talks were interesting and lively, and I was incredibly impressed with how gracious and engaged both men were with audience members, young and old alike, during the question and answer period. 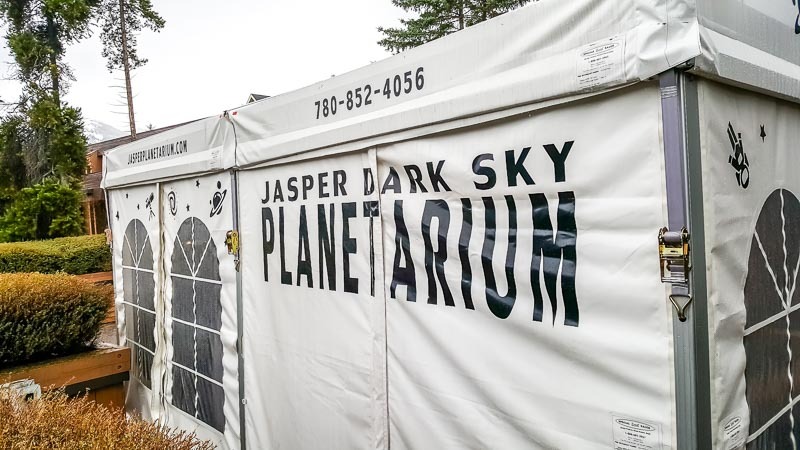 There’s plenty for kids to do at the Jasper Dark Sky Festival, from having fun at the planetarium (more on that later!) to hands on fun at the Big Bang Expo. 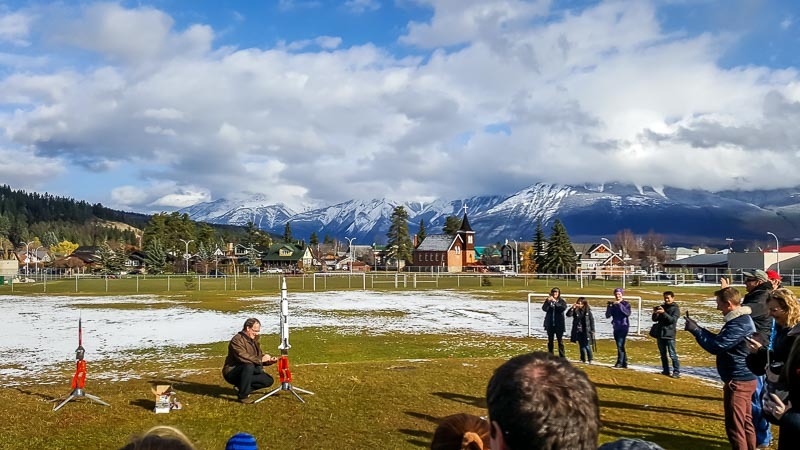 Big Bang Expo, presented by TELUS World of Science at the Jasper Elementary School, is chock full of real life experiments and experiences for kids and adults alike. There’s a lot of fun building and flying model rockets, and plenty of science-related activities indoors. 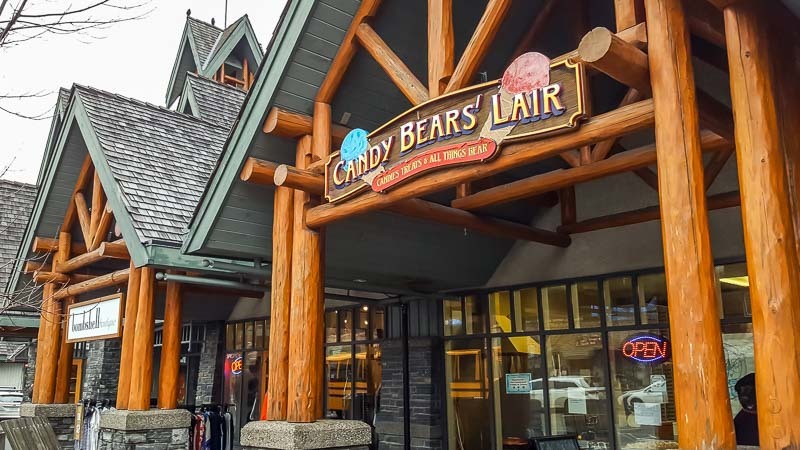 For a small town in the mountains, Jasper has a surprisingly excellent selection of top notch restaurants. You’ll find everything from gourmet to casual. Here are the restaurants I had a chance to try during my visit. One word – Yum! 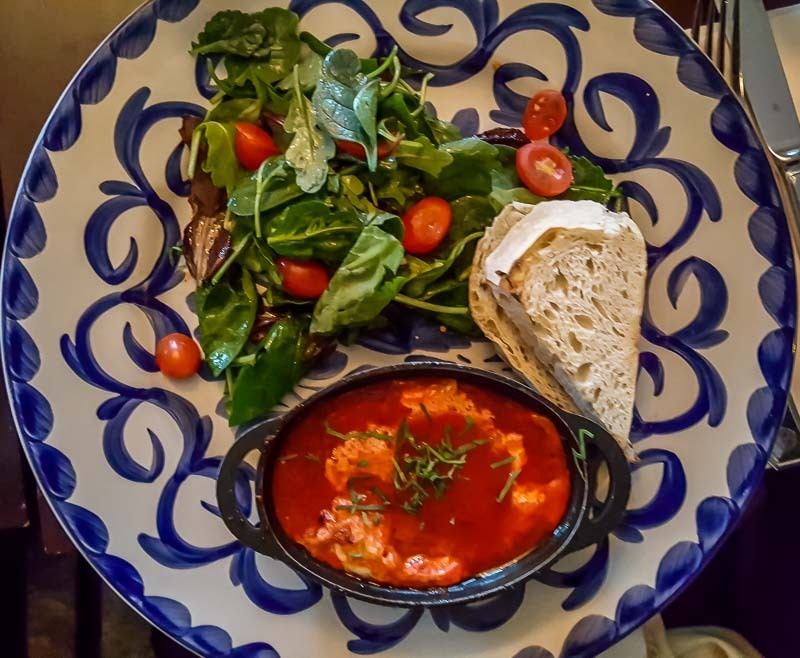 The elegant but relaxed Orso Trattoria is located inside the gorgeous Jasper Park Lodge. It also has an enviable ground level spot with stunning mountain and lake views. The menu’s full of farm to table goodness, with interesting dishes like breakfast poutine (with hash browns), croque madame, and, of course, avocado toast (delicious!). Breakfast is served all week, but dinner is only served Saturday and Sunday. Locally owned, Evil Dave’s Grill is a casual, fun place with great food. Dishes like Malevolent Meatloaf, Fiendish Falafel and Karma Curry all have a diabolical twist. I tried the Karma Curry, and it was spicy, flavorful, fresh and darn tasty. Be sure to try the Beautiful Brie, a wheel of almond and panko crusted deep fried brie, on chilled pear puree, with toasted baguette. Delicious! 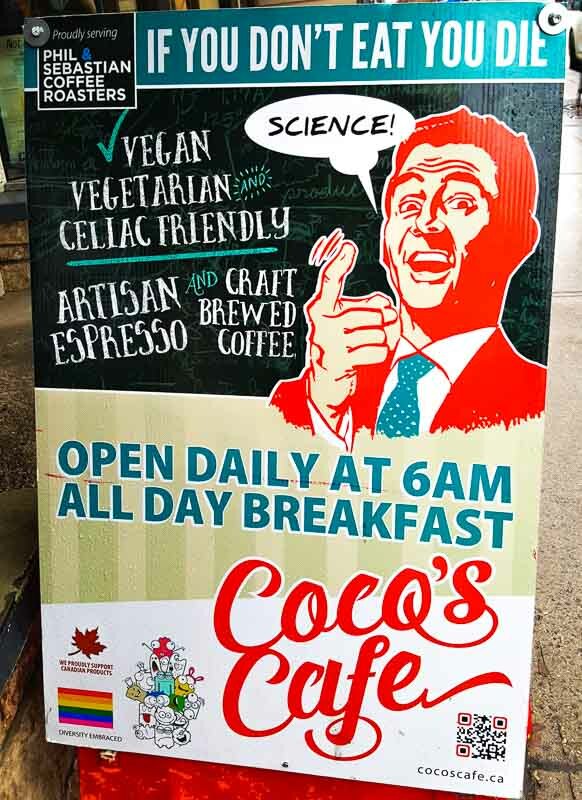 Of all the restaurants I tried in Jasper, funky and fun Coco’s Cafe was my favorite. Everything I tried here was perfect, from coffee to a bagged lunch with a spicy, flavor packed vegetarian burrito. It’s a locally owned joint that specializes in vegetarian, vegan and celiac friendly fare. The Jasper Brewing Company is a bustling place packed with locals and tourists alike. The menu has a great range, from confit duck tacos, to delicious warm buttered soft pretzels, to veggie burgers and pan roasted Ora King salmon. The beer’s pretty darn good, too! I got a chance to try the Emerald Lounge, located just off the lobby to the Fairmont Jasper Park Lodge. After a long delay with my shuttle, the Emerald Lounge’s roaring fireplaces and comfy chairs were a welcome sight. It’s open all day until late, with gorgeous views and a welcoming vibe. Don’t miss a stop at the Jasper Planetarium. The inflatable dome planetarium is a 360 degree astronomical immersive experience that’s fun in any kind of weather, even if the skies are cloudy. It’s well worth a visit, with interesting and informative narration. See the Jasper Planetarium website for more info and ticket prices. 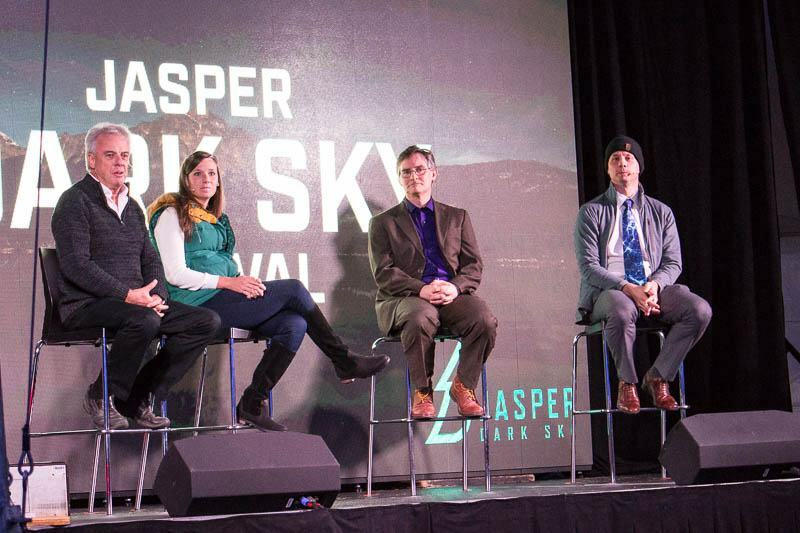 In addition to the fantastic keynote speakers, each year the Jasper Dark Sky Festival hosts a Spacetalks Panel. It’s hosted by knowledgeable and entertaining science journalist Natalie Panek, and features different scientists each year. This year, the panel was moderated by CBC Radio’s Bob MacDonald, with presenters including astrophysicist Rob Thacker, Scientific American Contributing Editor John Rennie, and Rocket Scientist and Explorer Natalie Panek. There’s a lot to love at the Dark Sky Festival, but SPACEtalks was one of my favorite parts, as it was fun, casual, and just so interesting! Watching the Stars at the Jasper Dark Sky Festival. Photo Courtesy Tourism Jasper. 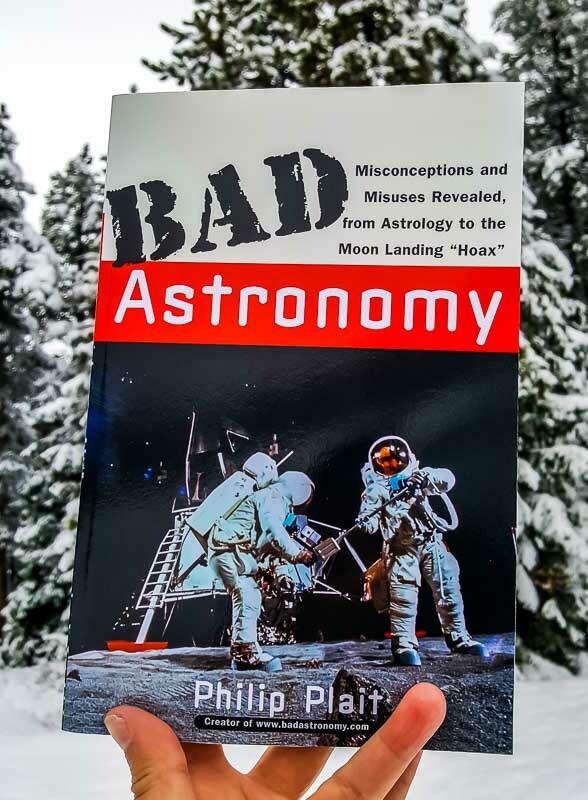 The SPACEtalks panel and other events are hosted by Dark Sky Festival favorite Niki Wilson. She’s a knowledgeable and interesting science journalist, published in the likes of like BBCEarth, Motherboard, Canadian Wildlife Magazine, Natural History Magazine and Canadian Geographic. 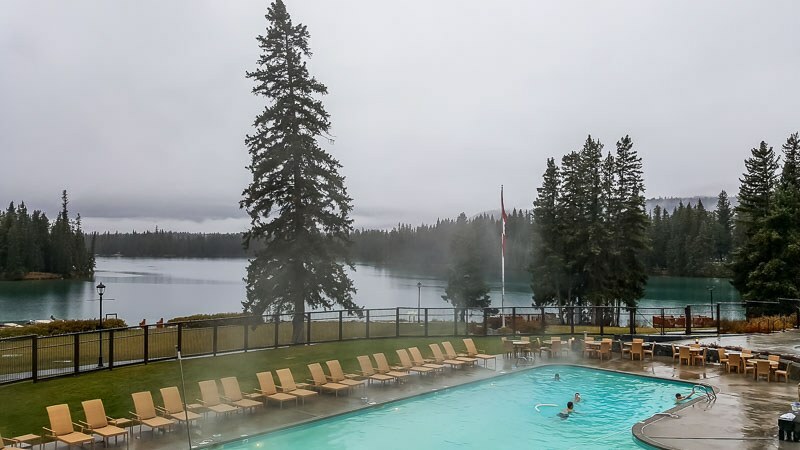 Jasper’s home to plenty of great accommodation, but I was lucky enough to stay at the iconic Fairmont Jasper Park Lodge. 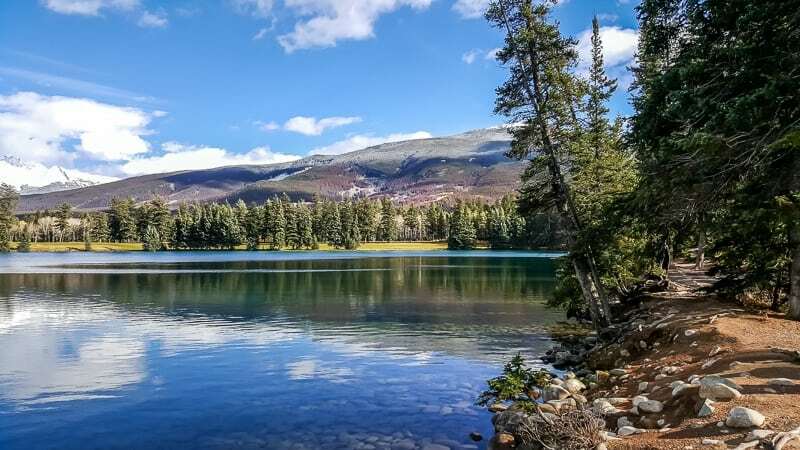 This is a stunning 700 acre year-round luxury mountain resort that’s located on the shores of Beauvert Lake. There’s a heated outdoor pool (enjoyable even in winter) located in a gorgeous setting, and plenty of luxury touches around the entire hotel. This is an unusual hotel in that it’s rooms are a village of heritage log cabins all interconnected by picturesque paths. There are also luxurious Signature Cabins. Despite being known worldwide, Jasper, Canada is still a small town, and it feels like it. There are only about 4,500 residents in the town, so you’re almost guaranteed to be bumping into people you recognize from earlier in your trip. It makes for a welcoming experience. 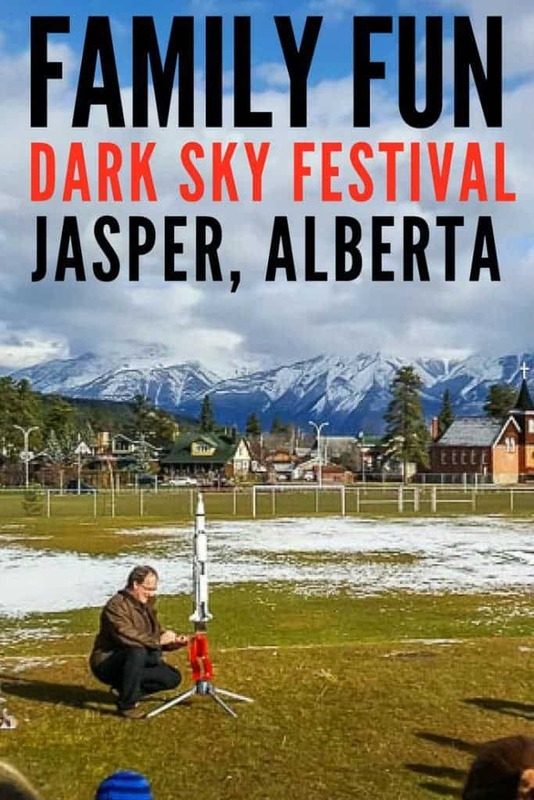 You can get all of the Festival details as well as learn where to get Jasper Dark Sky Festival tickets on the Jasper Dark Sky Festival Website. 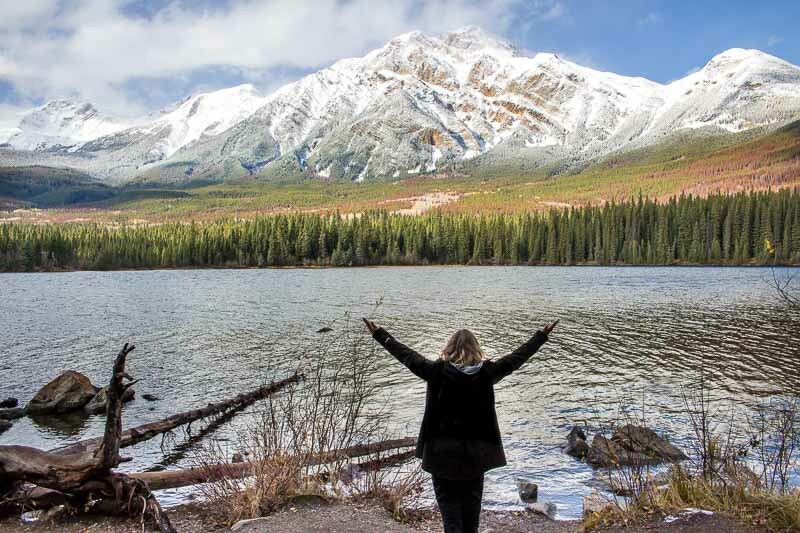 You can learn more about Jasper activities, accommodation and places to eat from Tourism Jasper’s excellent website right here. Jasper is located 362 kilometres (225 mi) west of Edmonton, Alberta, and 290 kilometres (180 mi) north of popular Banff, Alberta via the Icefields Parkway. The Icefields Parkway is a beautiful stretch of highway with cascading waterfalls, ancient glaciers that you can walk upon and clear emerald lakes set in gorgeous valleys of thick pine forests. You can also get there from Kamloops, BC in about 4 1/2 hours or from Calgary, Alberta in about the same amount of time. Temperature: During October, Jasper’s surprisingly warm for a town high in the Canadian Rockies, with daily highs averaging 50 Fahrenheit (10 Celsius), and lows averaging 30 Fahrenheit (-1 Celsius). 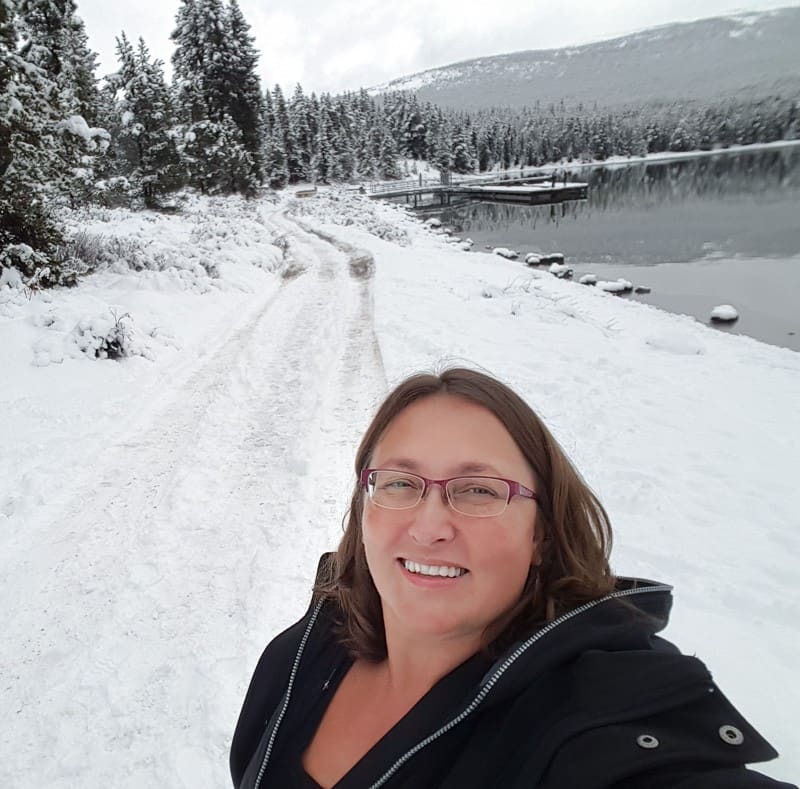 When I was there, there was little to no snow in the town site, but higher elevations like Maligne Lake already had some heavy snow. What to bring: Because this is Canada, and it’s October in the mountains, be sure to bring a warm coat, warm shoes or boots, mittens and a touque (warm hat, for the non-Canadians out there). Since you’ll be outside at night watching the stars and northern lights, make sure you dress for the forecasted lows. The closest airports to Jasper are Edmonton International airport (390 km) or Calgary International Airport (430 km). There is an airport in Jasper itself, however there’s no direct commercial flights offered, as it’s used mostly for diversions and delivieries use. From Edmonton or Calgary, you can self drive, or take a shuttle. SunDog Tours operates shuttles from both Calgary and Edmonton. If you’re not used to driving in snow and ice, I’d advise taking a shuttle during the winter for safety. I was hosted at the Jasper Dark Sky Festival by the kind folks at Tourism Jasper.